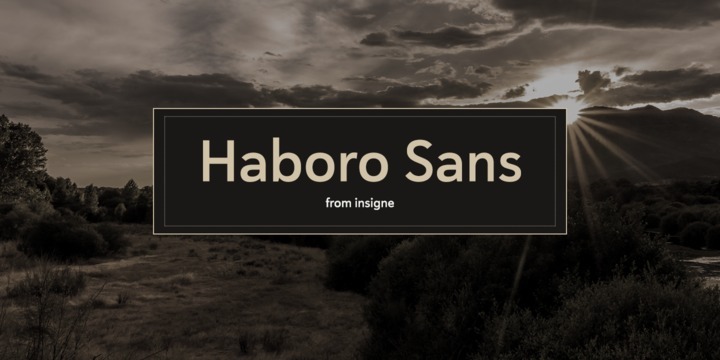 Haboro Sans is a contemporary sans serif typeface created by Jeremy Dooley and published by Insigne which comes in 3 widths (Normal, Contensed, Extended) each with 7 weights (from Light to XBold) and italics, a wide range of OpenType features and language support. It is characterized by Cap Height, x-height, descender, sharp apexes, minimal stroke contrast and blunt terminals. With a geometric touch, it merge well on any kind of project, such as packaging, branding, poster, print, editorial and so on. Also you can check Haboro Slab and Haboro. Enjoy! A font description published on Wednesday, August 10th, 2016 in Fonts, Insigne, Jeremy Dooley by Alexandra that has 3,205 views.